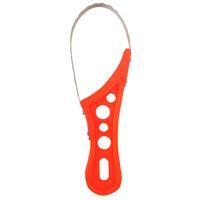 Strong plastic scaler that won’t rust or cut your hands like a metal scaler. Ecooda Fish Scaler Ultimate Scalers ergonomic handle fits perfectly in the palm of your hand for comfort when scaling those big catch’s. The stainless steel blade caters for fine or course scaling, has a laser etched ecooda logo and provides slight flex for fast efficiency. Brand: Ecooda Product Code: 5026 Buy your Ecooda Scaler with confidence from Australia's trusted tackle store Australia Wide! Seen it cheaper? Fill out our Price Match form here.